In December of 2009, Dobby was 10 months old and weighed 60 pounds (about 27kg). He had spent all summer grazing and swimming, and life was good. In July he had moved outside to sleep under the stars (well, not quite) but he clearly preferred the great outdoors. Suddenly: frozen water and crunchy mud. Little Dobby’s first winter was a nasty shock. What happened to his swimming pool? Where did the grass go? Dobby was allowed to sleep indoors during cold weather, right where he slept as a baby, next to my bed. Now we had to block off the closet and other chewables. Indoors was cozy and warm and we encouraged him to sleep in the bedroom with us. We spread out blankets for him, but he was angry and marked them. He marched to the kitchen door and asked to go out. We opened the door and frozen air smacked him in the face. The outdoors was broken: why didn’t I fix it? Kind of small for swimming. His baby bathtub was filled with warm water and toys. It’s a big tub, but can you imagine a full-grown Dobby in there, twice the size? Having a rambunctious capybara indoors is a full-time job. It’s sorta like letting a couple gerbils run around on your bed. They are so fun to watch, and then you stop paying attention for a few minutes and they are pooping everywhere and chewing their way in and out of your pillowcase. Some winter activities remained the same. At 10 months, capybaras are still babies. (Look how short his fur is!) He was happy indoors for milk time and a nap but then out he went. I kept warm water in his potty bowl to encourage him to use it outdoors. You can see that there is ice on the deck. He still had a potty bowl indoors, but he had been living outdoors for six months and rarely used it. It’s actually more convenient when capybaras poop outside. But you do have to keep the ice out of the bowl. When it freezes in Seattle, it often stops raining and the sun comes out. We still played with the ducks and hens, and went to the front yard to graze. He especially enjoyed looking at the pond next door. It didn’t freeze and the wild ducks flamboyantly splashed and dabbled, as if it was actually warm over there. He wanted to go next door where the weather was obviously better. When he came back in, he would warm his paws on the heat register. These were the early days, when a portable exercise pen could keep him confined to the kitchen. And before he started eating my cookbooks. The guinea pigs were still a bit higher than his eye level and Ziggy hadn’t started to taunt Dobby. Needless to say, the hamster in the blue cage was oblivious to the Rodent Royalty inches from her face. We also hadn’t figured out how to keep the kitchen door closed, and Dobby hadn’t yet learned how to use his little door knob to open it. Keeping Dobby entertained was The Bartender’s full-time job because I had to go to work. Fortunately, capybaras, even young frisky ones, are okay with hanging out, napping, chewing up paper bags, and tossing plushies around. Even more fortunate is the usual brevity of our arctic weather. 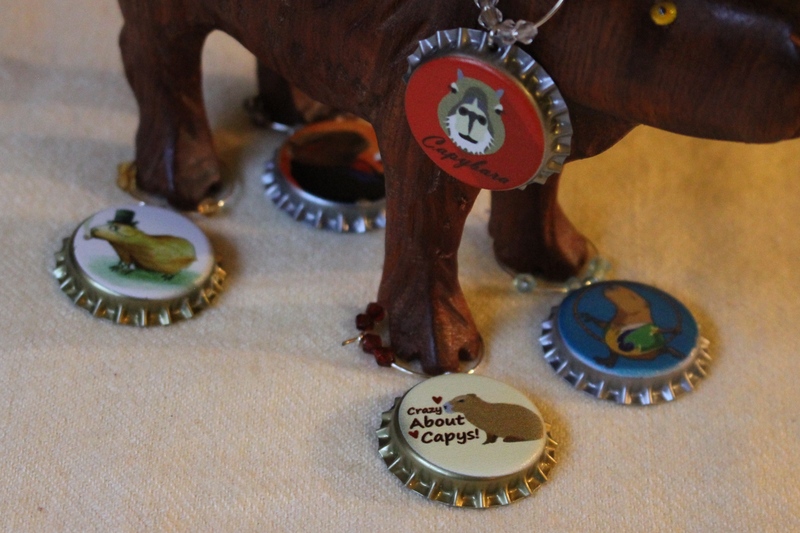 Capybaras are social animals, but they do reach saturation when they get too much attention. When Dobby turned his back on us like this, it meant he needed a “time out” from us. This isn’t the whole story, though. This is the G rated story. The pg-13 story is in the book. An older blog version is here. He made an ungodly mess every evening, dark acres of capy poop minefields between the bed and the bathroom door. A dozen rugs and a dozen blankets to change out every day and then the washer broke. Dobby was “sick” except he wasn’t. Oh, the memories. After Dobby died, I spent six months of avoiding the pain that Dobby’s memory brought me. I can finally find joy in reminiscing. I have thousands of photos and videos. You have probably seen the best ones, but I might as well share these seconds with you as I look through them. I also have some old mini-dv’s that might have some baby Dobby videos. Cross your fingers. Thank you for sharing Dobby with us.